She’s been taught that pleasure is sinful…Now Miss Lily Beecham is determined to find out for herself! A chance meeting with a viscountess, and Lily is invited to the ball. Freed from dowdy gowns and worthy reading, Lily charms Society. Except for the cold, aloof–and wildly handsome–Mr. Jack Alden. Lily soon learns that Jack’s cool demeanor is belied by the warmth of his kiss. But at the end of the Season she must return to bleak normality. Unless wicked Mr. Alden can save her from a future of good behaviour. Mr. Alden choked on a sip of his wine. Lily saw his jaw tighten and when he spoke, his light tone had been replaced with something altogether darker. “Hope?” he asked, and his voice sounded only slightly strangled. It was a struggle, she could tell, but still he retained his expression of bland interest. Curse him. “Do you crave adventure, Miss Beecham?” he asked. “Travel perhaps? A flock of admirers?” He was regaining his equilibrium, fast. “Or perhaps your simple tastes only crave dessert?” He flagged down a passing footman with a tray of pastries. Her eyes locked with his while she took a large bite, only to gradually close in ecstasy. She chewed, sighed and savored. “Oh, I must tell your mother to try one—the burnt orange cream topping is divine!” Breathing deep, she held her breath for several long seconds before slowly exhaling. She opened languid eyes, taking care to keep them half hooded as she glanced again at Mr. Alden. And promptly forgot to take a second bite. That had done it. At last she had cracked his polite façade. He stared, the green of his eyes nearly obliterated by pupils dilated with hunger. It wasn’t the tart that he hungered for, either. His gaze was fixed very definitely on the modest décolletage of her gown. 4 1/2 stars! The allure Deb Marlowe’s Her Cinderella Season is apparent from page one and continues as we immerse ourselves in the story of Jack and Lily. . .Run out and pick up Her Cinderella Season and sit back and prepare to be entertained. Deb Marlowe provides us with another pleasurable read. The sequel to AN IMPROPER ARISTOCRAT, HER CINDERELLA SEASON is a lively, entertaining Regency tale about two people who despite their initial meeting, change either’s lives. The search for the violent, unpredictable Batiste brings the couple together as Lily comes to realize Jack’s motives are honorable. Secondary characters almost fade into the background as Jack and Lily grow closer. There’s ample romance and plenty of adventure and surprises. Don’t miss this well written, enjoyable book! 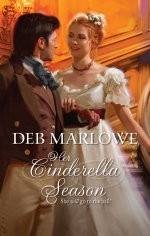 Deb Marlowe is a good storyteller and her characters always leave me happy to have spent time with them . . . a sweet taste of Regency love. Marlowe writes a sensual, emotional and poignant love story.